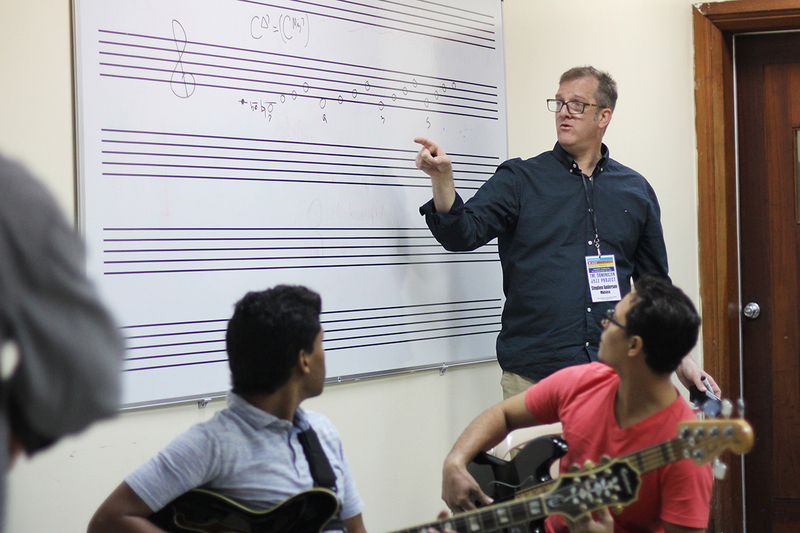 Music professor Stephen Anderson explains some of the theory behind improvisation in jazz composition during a master class at the National Conservatory of Music in Santo Domingo. Steve Anderson surveys the group of college-age musicians — over 30 of them have squeezed into a small classroom to attend his master class at the National Conservatory of Music in Santo Domingo. Every eye is on him, bright and attentive. “Carne!” says one of the students. “Eso — exacto,” Anderson says, pointing to the student. Yes, exactly. Anderson fell in love with Latin music as a college student — but he wasn’t anywhere near Latin America. Attending a university in Utah, he studied traditional jazz and classical composition and played in a country band on the weekends. To earn more money, he applied for a pianist position in a salsa band. “It was all these guys from Colombia,” Anderson recalls. “They weren’t really educated in musical notation; they played just enough piano to show me what to do.” Through this process — no formal instruction, no reading music, just copying what he was shown — Anderson learned his first Latin rhythms. He was hooked. Over the past few decades, no matter where he has lived, Anderson has always befriended musicians from Latino cultures. (He spent two years in Mexico, hence his Spanish fluency.) “We become good friends because I’m interested in their music, and I think they find me interesting because I’ve studied so much composition and theory,” he says. Three years ago, Anderson met Guillo Carias, a retired jazz musician from the Dominican Republic. “He played in the symphony there,” Anderson says. “He worked in Miami for years, but he retired to — of all places — Cary, North Carolina.” Carias regularly came to hear Anderson’s jazz trio play at a venue in North Raleigh, and the two became good friends. One night, out of the blue, Carias invited Anderson to play a concert in the Dominican Republic. When Anderson first traveled to the D.R. in 2014, he met musicians just as eager to learn from him — in particular, Guy Frometta, a drummer. “Guy and I were very like-minded, as he was interested in American jazz music and I was interested in Dominican music,” Anderson says. “So we were teaching each other. Mostly he was teaching me.” The result of that collaboration is The Dominican Jazz Project, a concert and music collaboration that resulted in a CD released on Summit Records in 2016. In spring 2017 Anderson was back in the D.R. to teach a master class and to perform at the Jazzomania Jazz Festival with the eight other talented musicians from The Dominican Jazz Project. The Dominican Jazz Project has been a prolific collaboration for Anderson and his fellow musicians, initiating unique teaching opportunities and creating lasting friendships. “When you have an opportunity to work very personally and intimately — sometimes you stay in their house and eat food with them — it changes everything,” Anderson says. Steven Anderson is professor of composition and jazz studies in the UNC College of Arts and Sciences Department of Music. He is also the director of the annual UNC Summer Jazz Workshop. This entry was posted in Creativity, Video. Bookmark the permalink.